How does that old saying about buses go? You know the one that postulates that if you wait long enough, three come along at once. Buses that is. 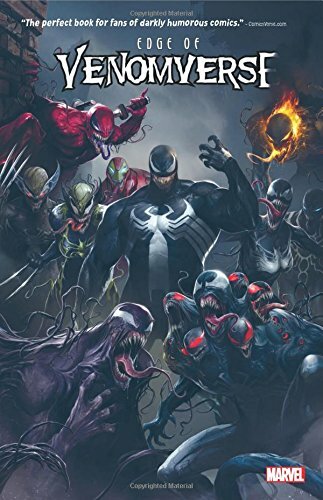 Well, it seems that Venom symbiotes are sort of like that, because no sooner have Eddie and his best pal been reunited, than the Marvel Universe is suddenly inundated with little Venom’s. 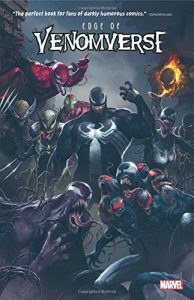 And while they’ve all arrived and turned up in different ways, they all find the hosts, and their hosts find them, in their blackest moments when death, or in Deadpool and Old Man Logan’s cases something far worse, seems absolutely certain. As we’re all aware, and I say that safe in the knowledge that if you’re reading this then you’re already pretty switched on and clued in to all sorts of awesome things, nothing in the four colour world happens by accident and the symbiotes teaming with their partners seems to be part and parcel of a far larger recruitment game initiated by what appears to be some sort of Venomized (and incredibly familiar) super solider intent on recruiting his own dirty dozen to help him fight a war in a strange, and most definitely far off, land. So who’s on mystery Venom soldier’s team list? Well, they’re definitely a mixed bag. There’s Deadpool, a somewhat obvious pick, who’s added to the roster following a darkly funny story in which he saves the world from weaponised parasites. Then there’s Ghost Rider, who thanks to being all Venomized has taken retribution, vengeance and punishment to a whole new level and X-23 who was already a merciless killing machine without the help of the symbiote which helps her to escape Weapon X and survive on the streets before being conjured away at one of the worst possible moments by her new commanding officer. Of course, it wouldn’t be a rag tag bunch of malcontents without Old Man Logan, who’s pulled into their ranks following a touching, heartfelt and incredibly personal confrontation. And finally, the last and oddest member of this Venom powered warband is Gwenpool who’s press ganged before she can properly “team up” with Daredevil following a less than legal boardroom battle with a lawyer whose clients whole heartedly believe that being armed to the teeth is the only thing that matters and all that you really need to win the day. I don’t know what super-soldier Venom was drinking when he sat down to choose potential members of his squad, but whatever it was I need to know where to get some. Because even though his team seems , and in most cases most definitely is, crazy, I can’t wait to see them in action in Venomverse.